Our standard surgeries include spaying, neutering, and soft-tissue surgeries, which most commonly includes mass removals, bladder stone removals, and laceration and bite wound repairs. Most of our surgical patients go home the same day as their procedure, with the exception of declawed cats. We may refer some of our patients recovering from extensive surgeries, such as gastrointestinal foreign bodies, to an emergency clinic where they can receive round-the-clock care. 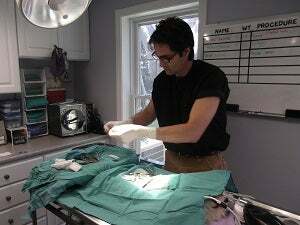 After surgery, the doctor or technician who assisted in your pet’s procedure will discharge your pet. At that time they will discuss your pet’s progress and instruct you on how to manage your pet’s post-surgical care and recovery.